Two entrepreneurs—one a certified yoga instructor and the other a marketer/package designer—have translated their love of yoga and healthy eating into The Kitchen Yogi. Their first products are cookie cutters in the shape of three yoga poses. Each cookie cutter comes with a healthy cookie recipe and instructions for doing the pose (perhaps while the cookies are baking?). The cookie cutters are $7.50 each or three for $20.00 (if you want one, you’ll want all three). Buy them online at TheKitchenYogi.com. Ten percent of profits go to animal welfare organizations. You can make make healthy Valentine cookies for your yoga-enthusiast friends by adding a small candy Red Hot heart (available in bulk here) to each cookie. 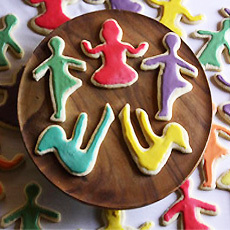 If you don’t want to bake, BakedIdeas.com makes the cutest gingerbread people (year-round) performing 10 yoga poses: Down Dog, Lotus, Plow, Tree, Triangle, Savasana, Spinal Twist, Warrior I, Warrior III and Wheel. You never saw a happier bunch of cookies. Baked Ideas also sells its cookie cuttters boxed with the gingerbread recipe for $32.50, in either the Down Dog Group or the Lotus Group.